Though we had a very light frost about 2 weeks ago, only the beans and sweet potato vines got nipped, so there’s still plenty to see. As I did last month, I’ve tried to limit myself to showing only what’s new this month. 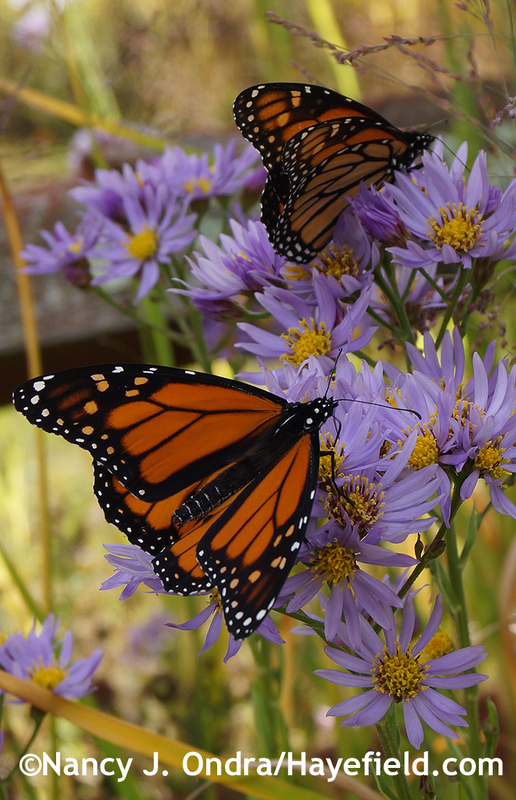 …and Tartarian aster (Aster tataricus), which was loaded with monarchs yesterday despite the stiff breezes. 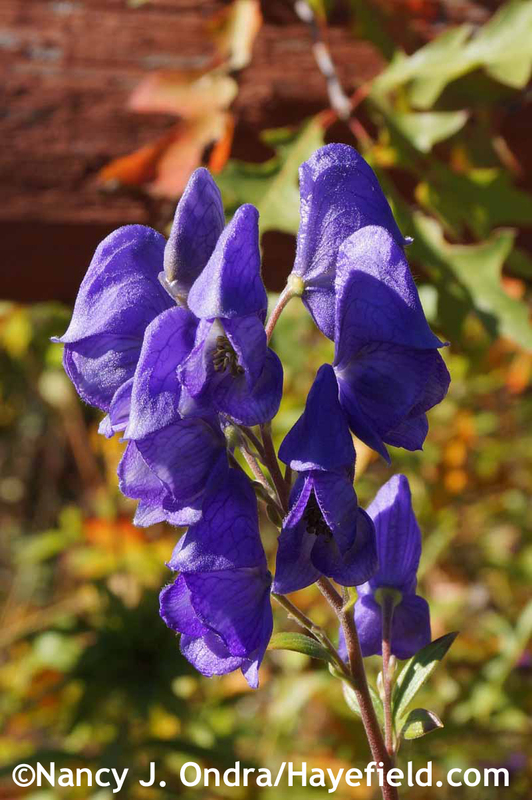 Azure monkshood (Aconitum carmichaelii) is another lovely addition to the flowers this time of year, as is ‘Sheffield Pink’ chrysanthemum, which just started opening a few days ago. Taurus mountain fleeceflower (Persicaria amplexicaulis ‘Blotau’) started flowering months ago, but it took a bit of a break during our very dry September. Now that we’re getting a bit of rain, it’s putting on another great show. The much larger ‘Crimson Beauty’, below, didn’t start opening its flowers until September. The lower third have just started to turn from white to pink; the rest are headed to red. Most of the burnets (Sanguisorba) are done blooming, but the clumps of purple Japanese burnet (S. tenuifolia ‘Purpurea’, below) that I cut back to about 1 foot in late June are just peaking now. Granted, seven sons flower (Heptacodium miconioides) technically isn’t flowering now, but the pink calyces do look like blooms. 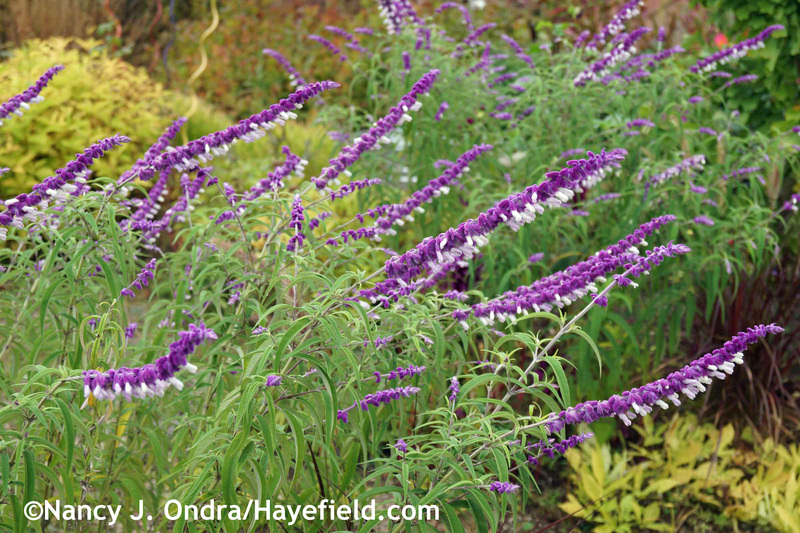 The chances of Mexican bush sage (Salvia leucantha) flowering before frost here are about even. This year, we got lucky, reminding me that it’s worth the gamble. 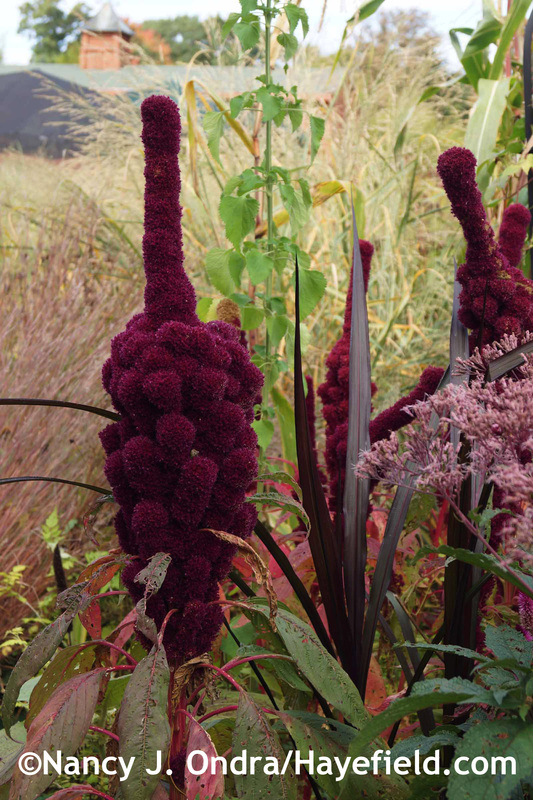 I know I’ve showed you the ‘Elephant Head’ amaranth before, but I couldn’t resist including it again. For some reason, the spikes mostly stayed upright this year, not developing the appropriate “elephant’s head and trunk” appearance. At least the ones above had the usual tall, straight-stemmed habit. The seedling below popped up in the gravel along the driveway: it’s barely 3 feet tall but, as you can see, it is heavily branched. “It adds a certain…er…welcoming touch for visitors,” Mom remarked. Let’s move on to something a little more elegant: the bulbs of the season. 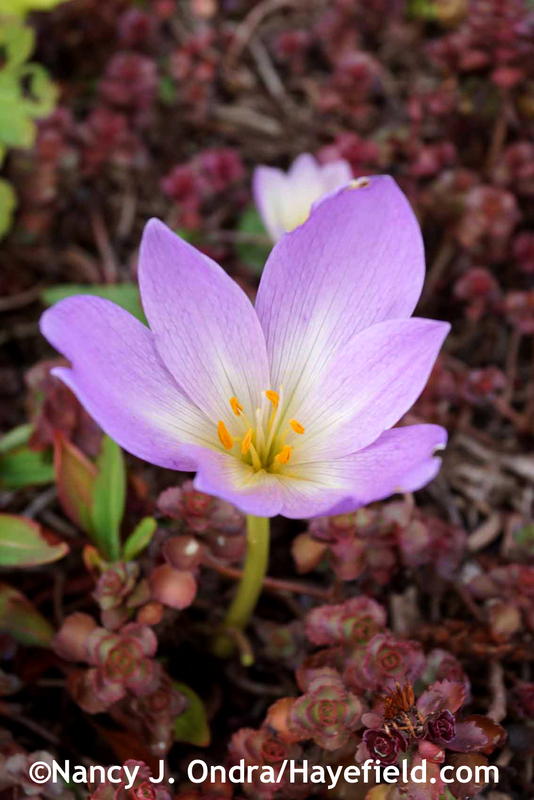 Ahhh, the colchicums. I started with the one below from my old garden. 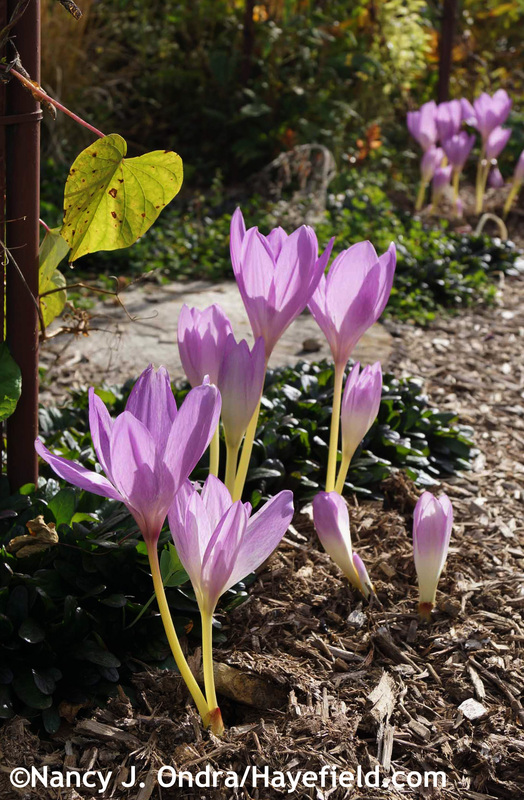 As far as I know, it’s the common autumn crocus (Colchicum autumnale). The clump below is growing along the driveway, coming up through the foliage on the edge of an orange coneflower (Rudbeckia fulgida var. fulgida) clump. Having them come up through leafy partners helps them stay upright and clean, so I’ve experimented with other companions as well. Below is ‘Big Ears’ lamb’s ears (Stachys byzantina) with another as-far-as-I-know-Colchicum autumnale. I’ve had varying success using ‘Big Ears’ this way. Sometimes it gets too vigorous and its leaves almost smother the blooms. 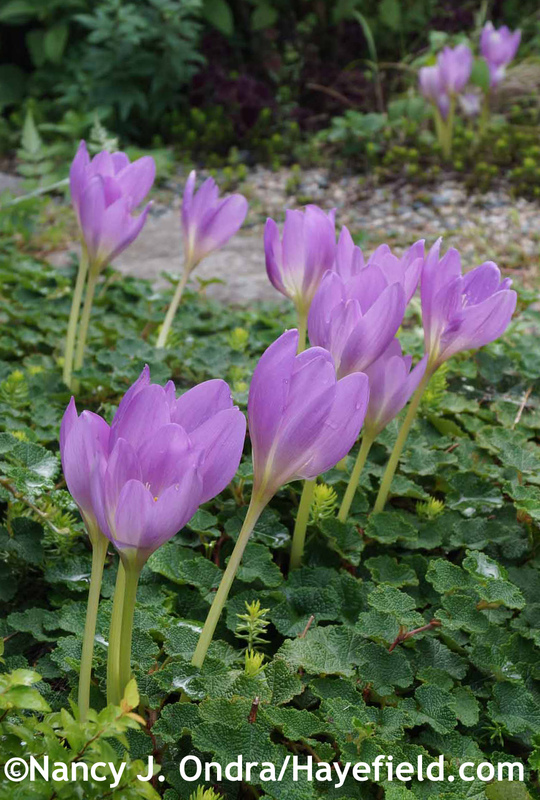 Usually, though, I end up cutting it to the ground in midsummer to get fresh new leaves for late summer and fall, and that seems to keep it in better proportion to the colchicum flowers. Above is ‘Rosy Dawn’ coming up through creeping bramble (Rubus pentalobus…also known as R. calycinoides, R. rolfei, and now, apparently, as R. hayata-koidzumii). Below is ‘Violet Queen’ with Chocolate Chip ajuga (Ajuga reptans ‘Valfredda’). I’m not crazy about the color of the ajuga with the colchicum, but they’re so happy together that I hate the idea of disturbing the bulbs to move them. 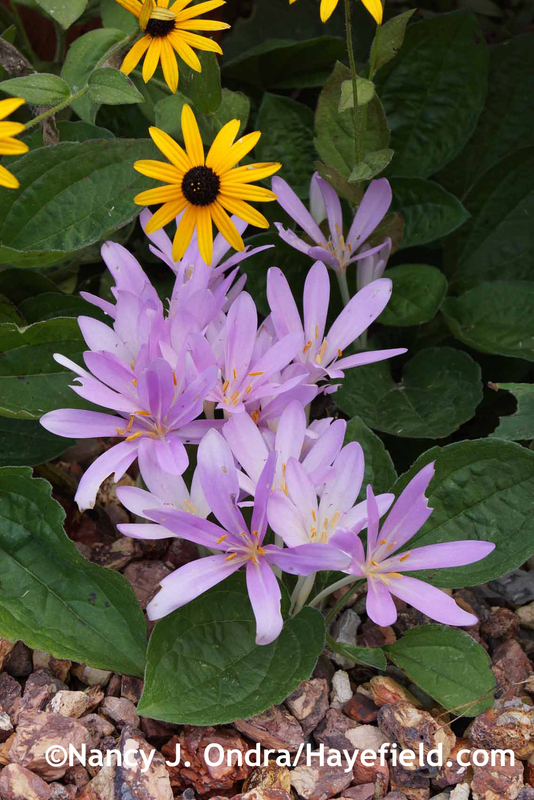 A few months ago, I got a wonderful surprise in the mail: a box packed with a variety of colchicums from fellow blogger and colchicum devotee Kathy Purdy of Cold Climate Gardening, giving me the opportunity to try out a few new pairings. Above is ‘Nancy Lindsay’ with the variegated foliage of ‘Triple Play’ smooth phlox (Phlox glaberrima). 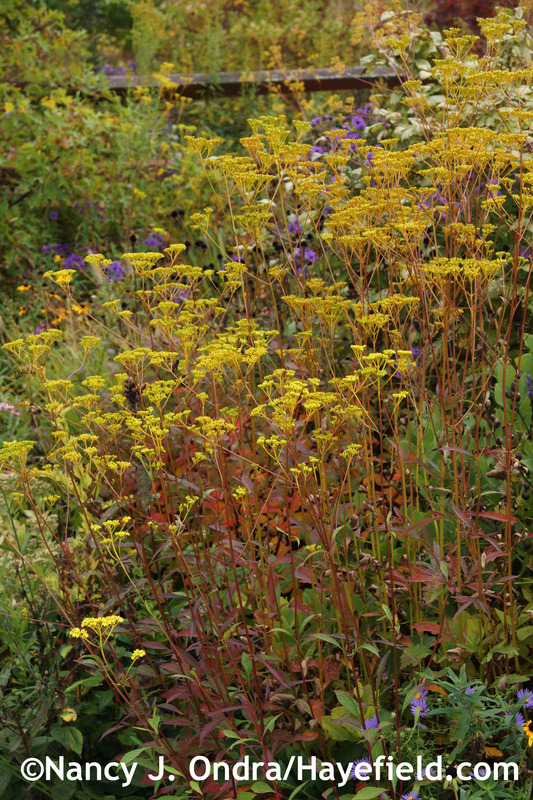 Below is probably ‘Zephyr’ with ‘Voodoo’ two-row stonecrop (Sedum spurium): like the ajuga, not a great color match, but then, who’s really looking at the ground cover, anyway? Below, the absolutely exquisite double white autumn crocus (C. autumnale ‘Alboplenum’) coming up through woolly thyme (Thymus pseudolanuginosus). 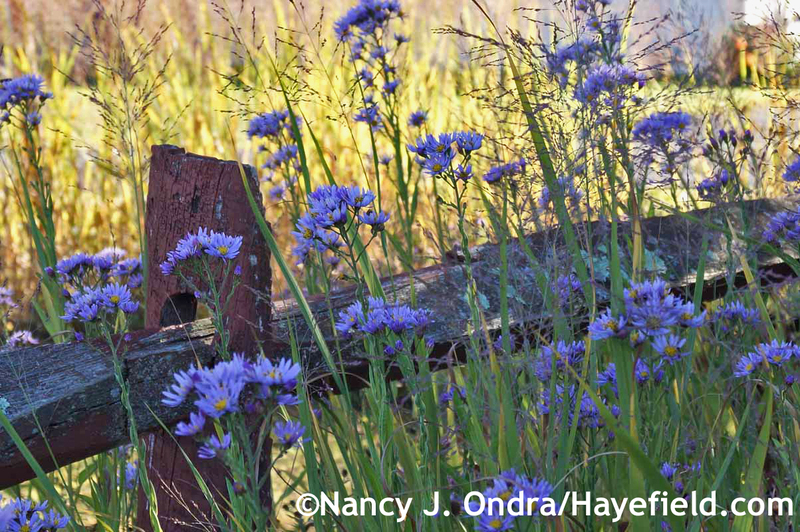 Lilies generally aren’t flowers of fall, but these are a special case. Last fall, reader Debra B. sent me a generous amount of Formosa lily (Lilium formosanum) seeds (thank you, Debra!). I sowed them in a 4-inch pot on March 8 on a heat mat and under lights and the first leaves appeared on March 17. In mid-April, I transplanted 50 of them into a plug tray, then planted them out in the Happy Garden in June. After that, I forgot about them, except when I had to remind myself not to pull out the grass-like seedlings when I was weeding. Imagine my surprise when a few of them started to bloom this fall, at about 1 foot tall. I knew they had a reputation of being quick from seed, but I thought they’d flower next year, not the same year as sowing. Overall, six of the 50 have opened. It’s such a delight when plants do surprising things. 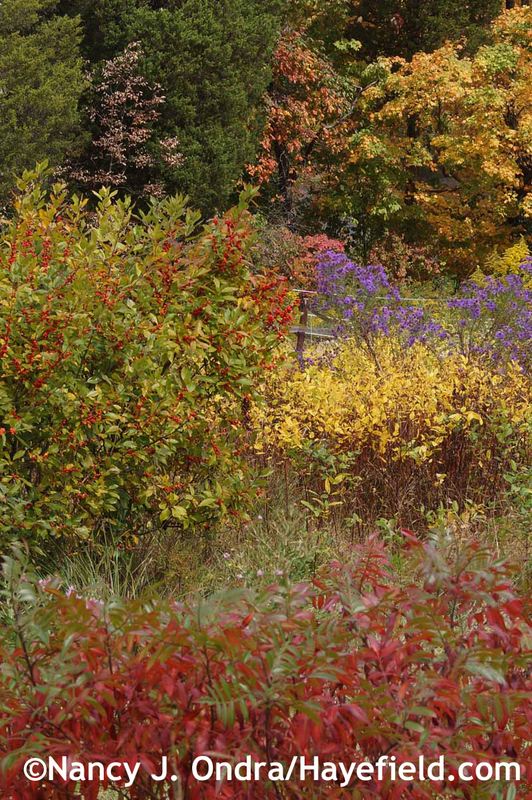 Well, back to our regularly scheduled seasonal event: the arrival of autumn colors. 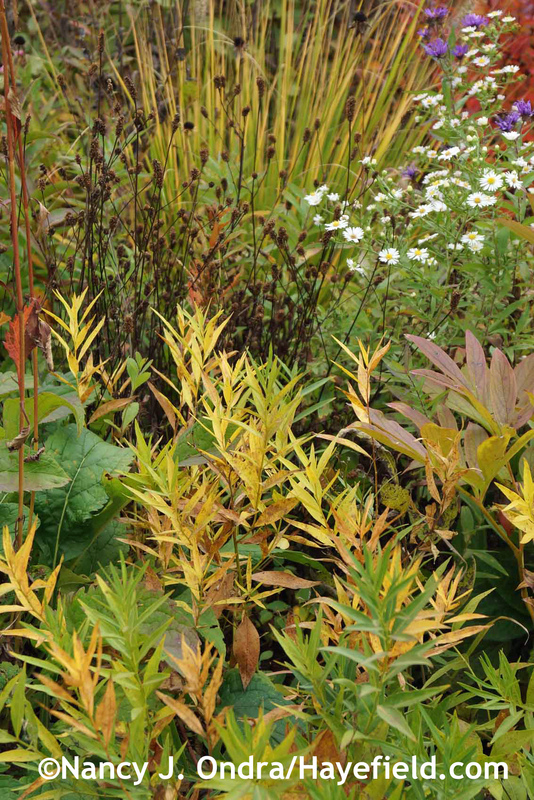 A few plants have both flowers and colorful foliage at the moment. Below is a clump of golden lace (Patrinia scabiosifolia) that I’d cut back to about 1 foot in early August, so it’s blooming now at about 4 feet tall with fall-red leaves. 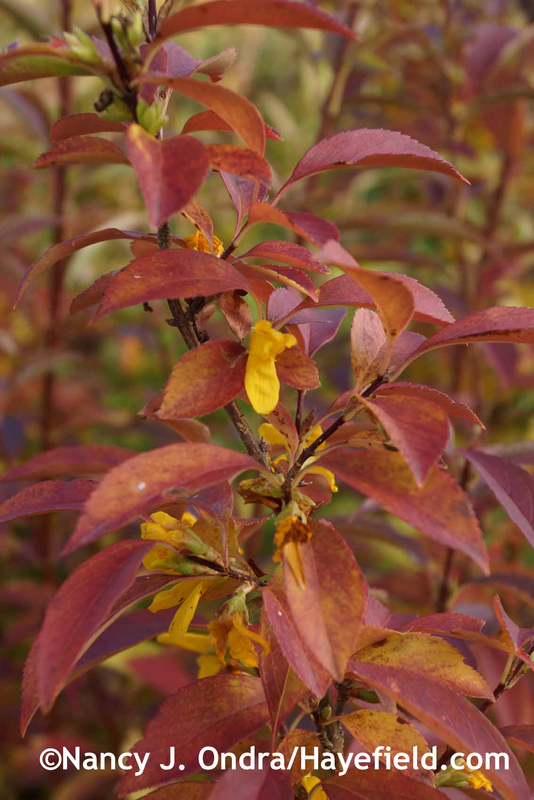 ‘Kumson’ greenstem forsythia (Forsythia viridissima var. koreana) mostly blooms at the normal time in spring, but I’ve seen open flowers on it pretty much any time from October onward. 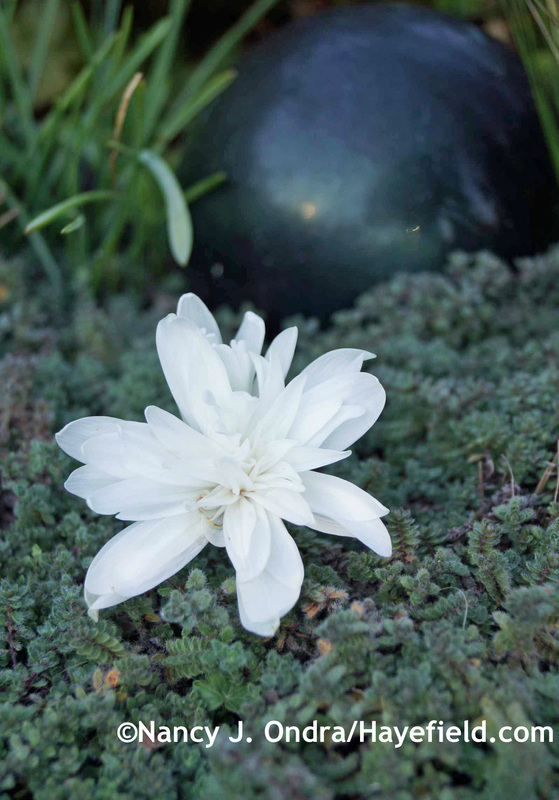 The most distinctive feature of ‘Kumson’ is its white-netted green leaves. The markings are most noticeable on the new growth. 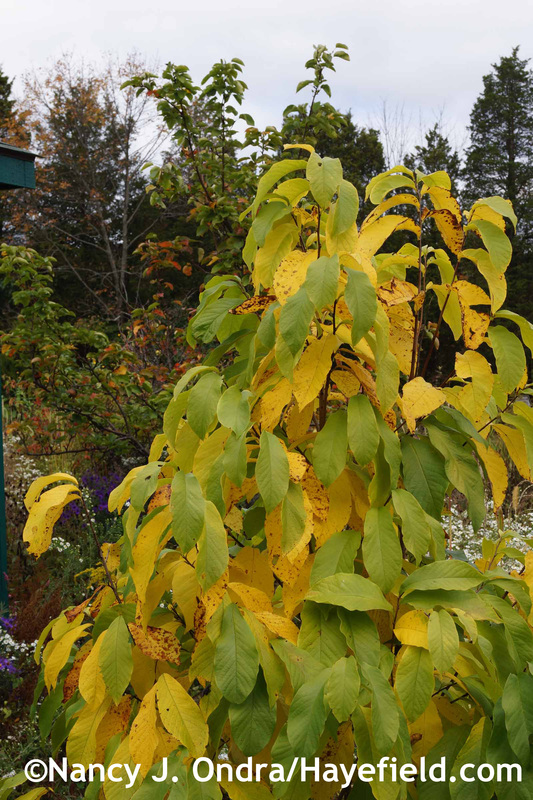 The older leaves are basically green, and they turn the gold and red colors shown above. 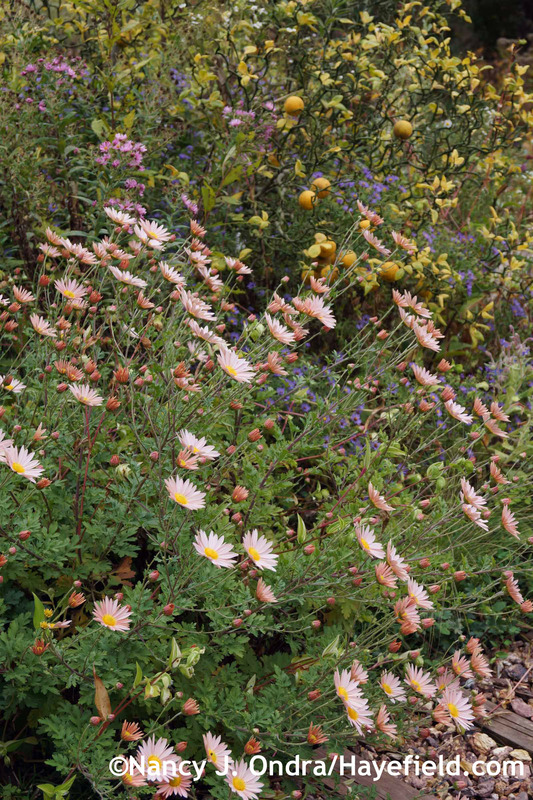 There are usually some variegated bits still around at this time of year, though, and they take on a pinkish blush. 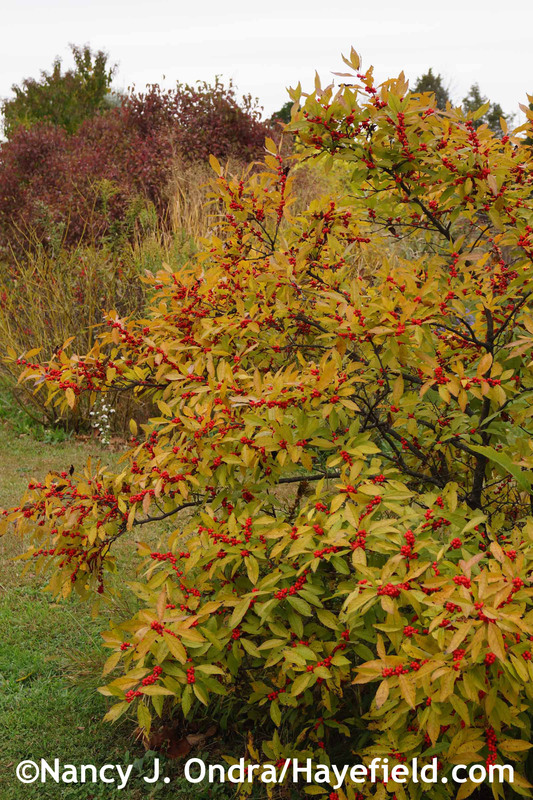 …and ‘Winter Red’ winterberry holly (Ilex verticillata), below. 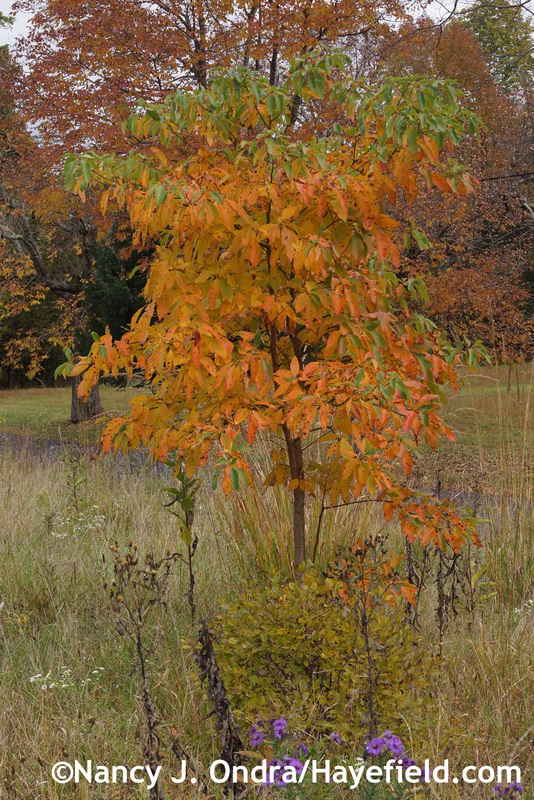 And finally, a quick spin through some standouts for autumn foliage color, starting with sassafras (Sassafras albidum). Above, is ‘Washington Park’ vernal witch hazel (Hamamelis vernalis). Below is ‘Orange Encore’ (H. x intermedia). It’s not very interesting in bloom but the fall color has been dependably rich. Above is one of my pawpaws (Asimina triloba), finally taller than I am. Below is an unnamed doublefile viburnum (Viburnum plicatum) in the lower meadow. 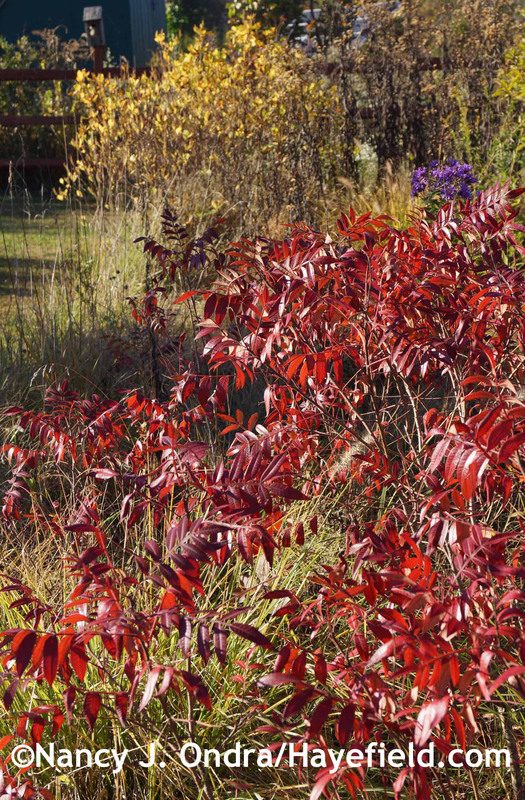 …above, ‘Ruby Spice’ summersweet (Clethra alnifolia); below, shining or winged sumac (Rhus copallinum). 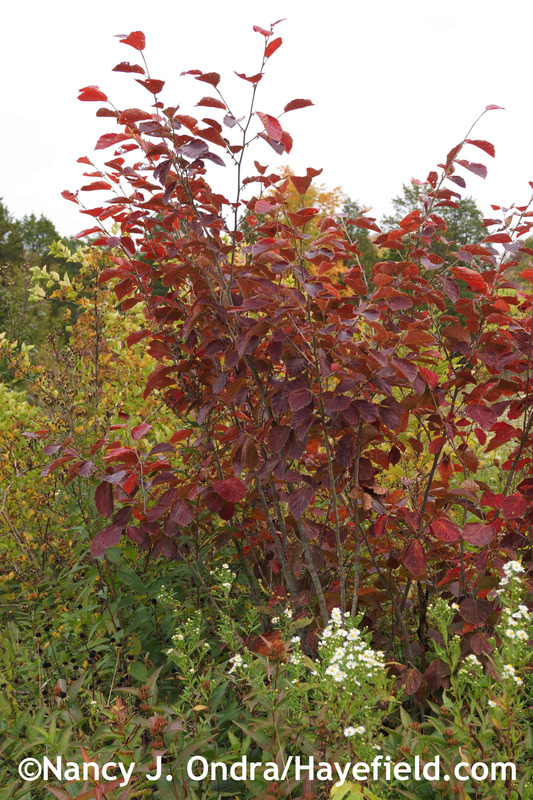 ‘Tor’ birchleaf spirea (Spiraea betulifolia) is dependable for brilliant reds, oranges, and yellows. Southern bush honeysuckle (Diervilla sessilifolia) has the same color range, but the hues are a bit more muted. 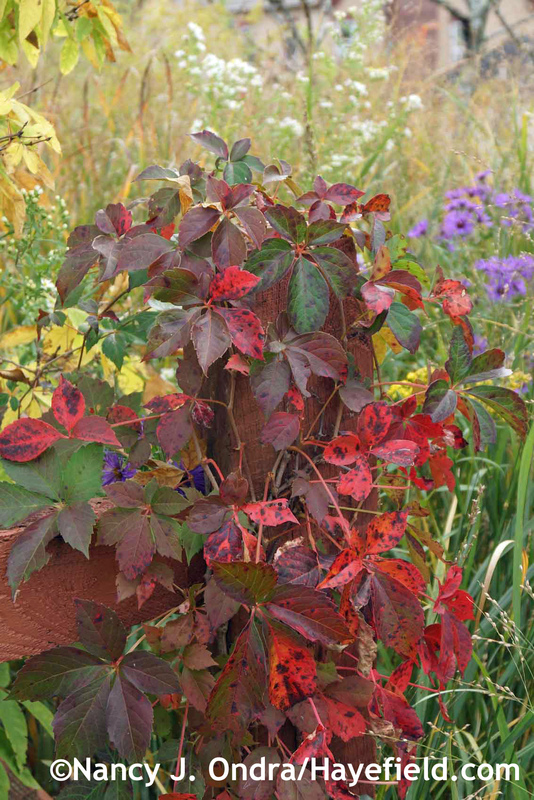 The birds are continually planting more Virginia creeper (Parthenocissus quinquefolia) along the fence. I pull out most of it, but at this time of year, I’m happy to still have some. 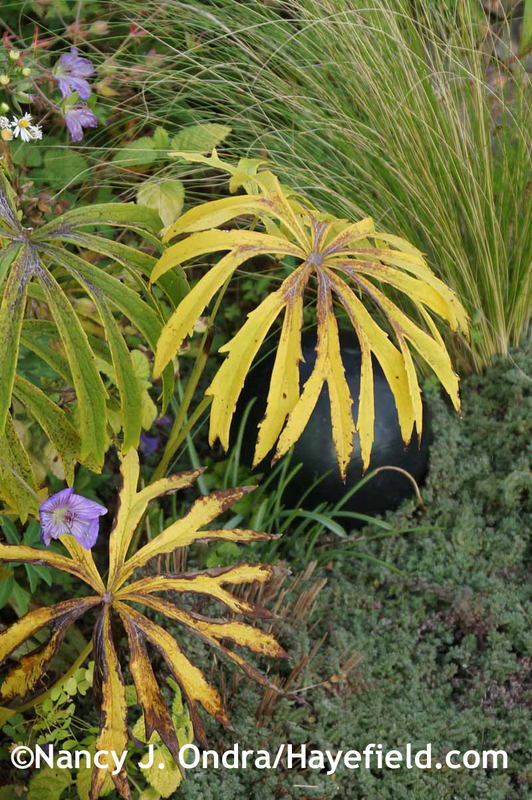 A few standout perennials in this category include shredded umbrella plant (Syneilesis aconitifolia), above, and balloon flower (Platycodon grandiflorus), below. 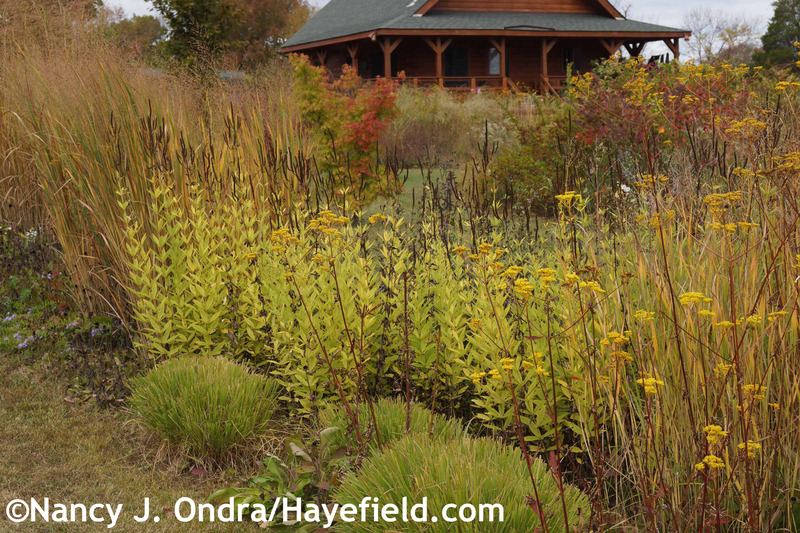 Above, Culver’s root (Veronicastrum virginicum); below, dwarf fleeceflower (Persicaria affinis) in front of ‘Big Ears’ lamb’s ears. 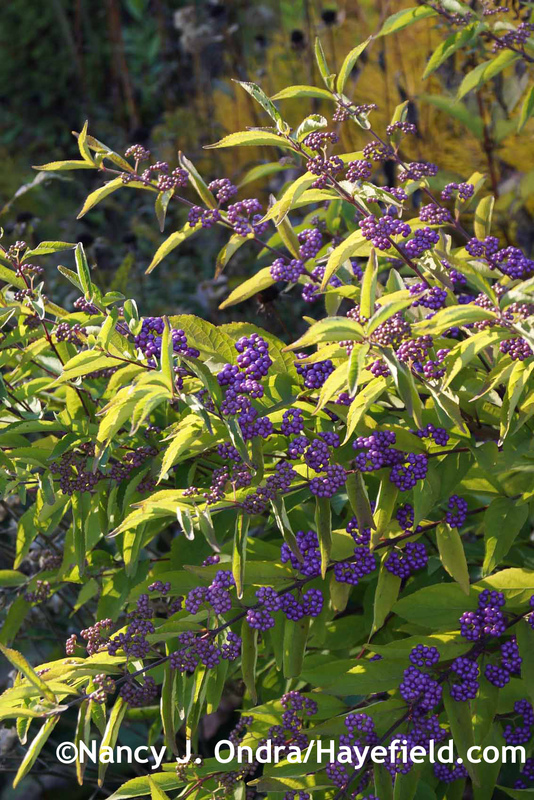 And, of course, the bluestars (Amsonia). Below is hybrid ‘Blue Ice’. Above, stiff bluestar (A. ridiga), and below, Arkansas bluestar (A. hubrichtii). 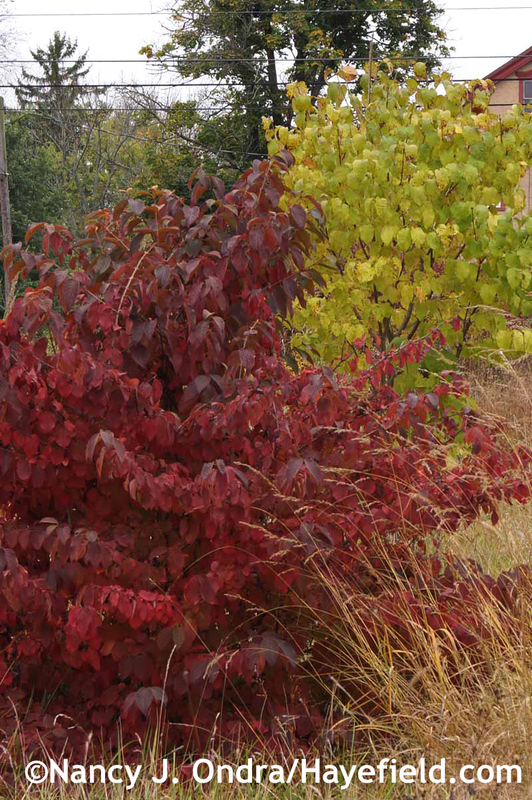 Technically, these two aren’t in fall color, but it’s fall, and they have great foliage, so here they are. Neither one is hardy, so I’ll have to dig them and drag them down to the basement soon. The cordyline isn’t bad to work with, but I’m really not looking forward to wrestling with the giant sea holly: its leaves are really pointy and have sharp, jagged edges as well. 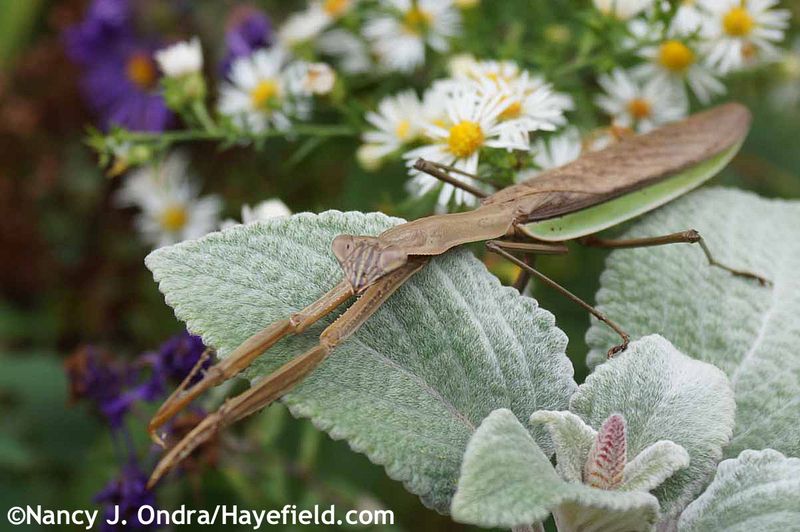 The foliage of silver spurflower (Plectranthus argentatus) is very much the opposite: so soft that it made a nice sofa for this lounging praying mantis. Can’t be praying all the time, I guess. I’m saving the garden and combination shots for another time, so for now, that’s it from Hayefield. 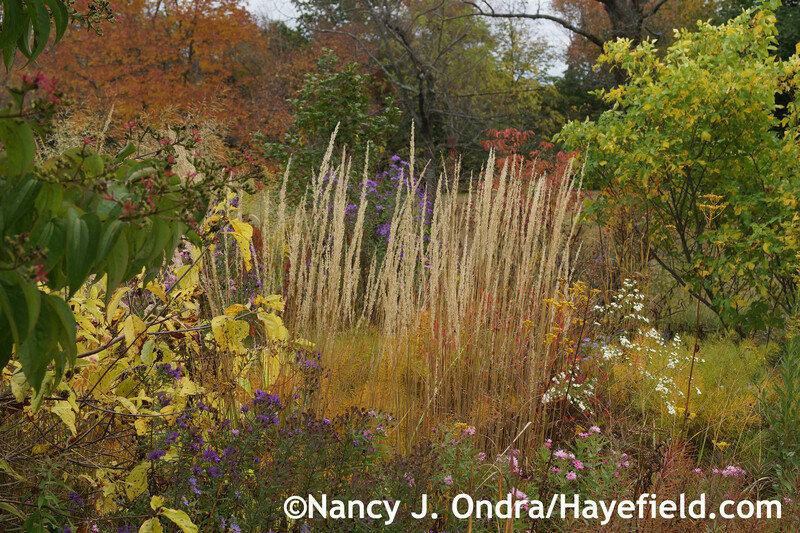 For a virtual tour of other October gardens, click over to Carol’s main Bloom Day post at May Dreams Gardens. Thanks for visiting! 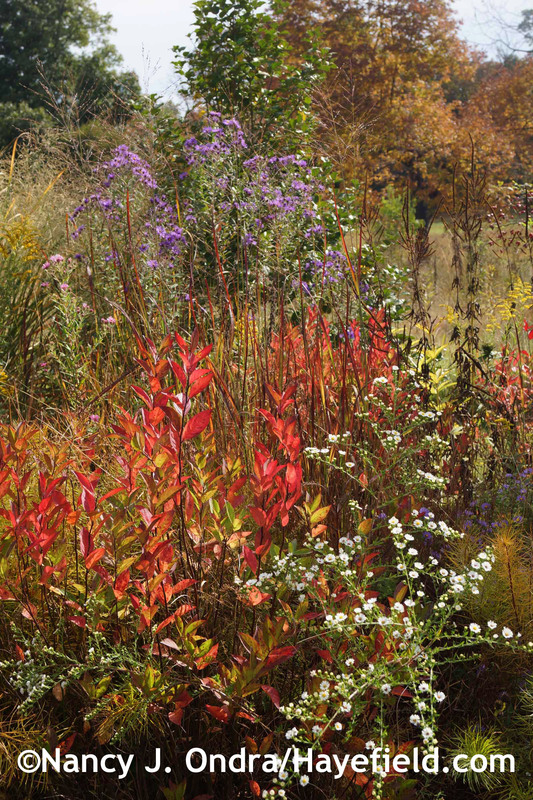 Your garden has so much color, in addition to the flowers all the colored fall foliage. All the different species of plants are always such an inspiration. 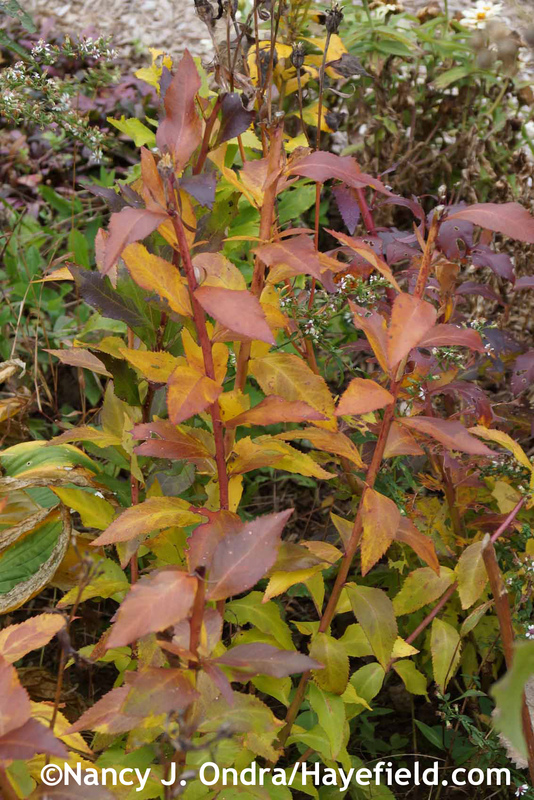 I’m growing Persicaria affinis for the first time and hadn’t seen its wonderful red fall color, so I’m looking forward to that, and I’m also enjoying its first bloom now. I hope the frosts stay away for a while for you. That’s a cute little plant, isn’t it, Hannah? It’s a bit of a spreader once established (though not problematic) and makes a really nice ground cover. It’s a pity that more places don’t sell it. I guess that’s because it doesn’t have one “wow” period, but here, at least, it has at least a few flowers at any time between early summer and mid-fall, and the foliage is dense and handsome. Good luck with yours! 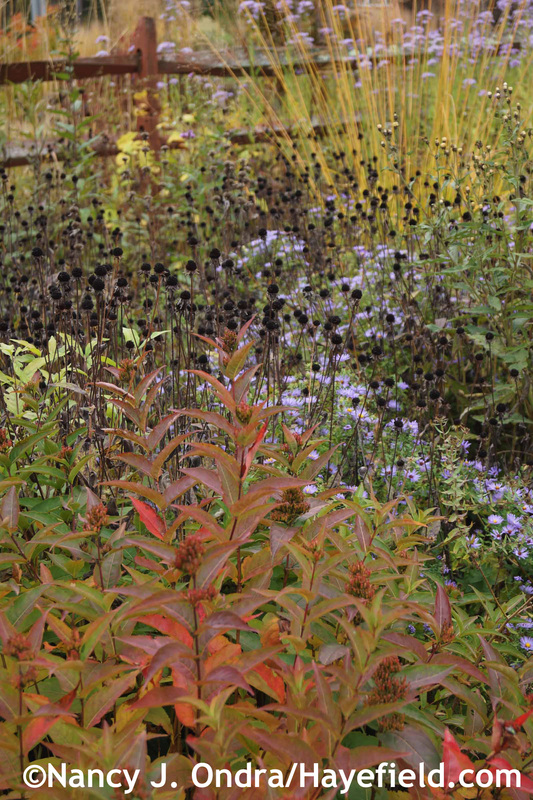 I like this Persicaria as a reliable weed-suppressing groundcover for sun. 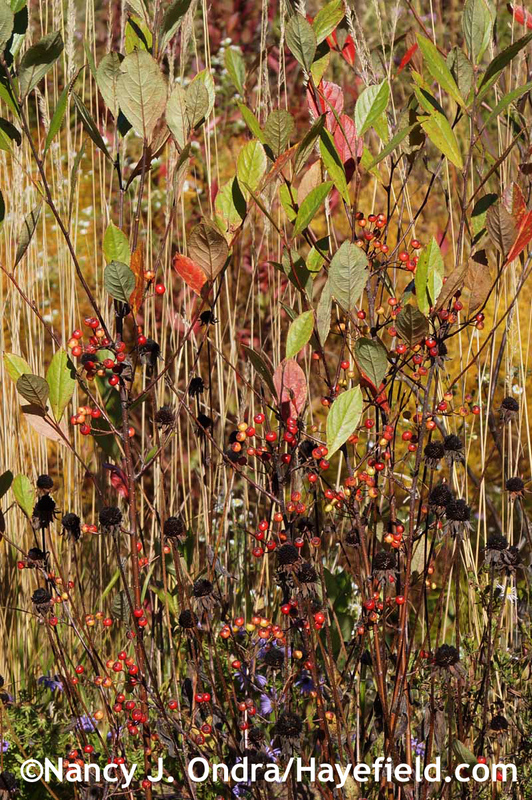 Is the Rubus pentalobus, another fast spreader you showcased here also dense enough to keep weeds in check? It does a pretty good job, though some things can seed in and sprout in spring. It would probably be better where you are; here, it tends to lose it leaves over the winter and takes a while to leaf out again. Nan, your dependably wonderful fall bloomday posts always teach me something, and this year it’s that I need more persicarias. Also that some persicarias get HUGE. Amazingly huge. 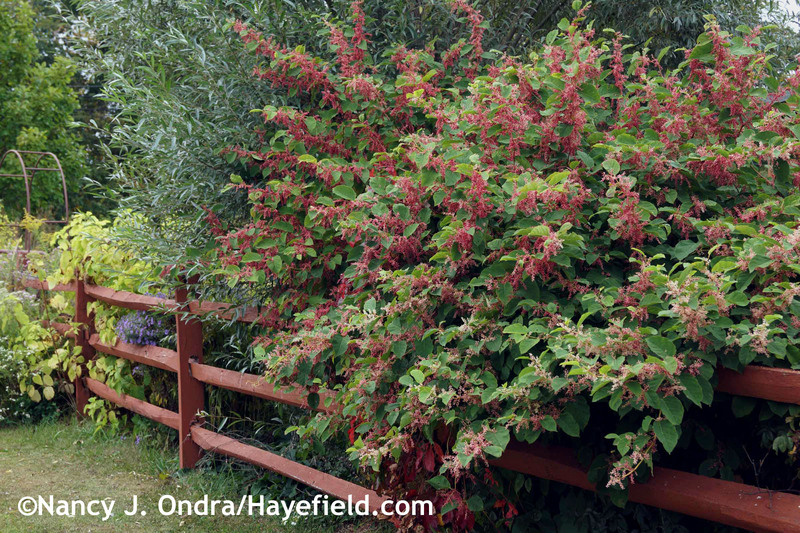 Oh yes, Alan: think of the galloping Japanese knotweed (Persicaria cuspidata)! It’s just as tall as ‘Crimson Beauty’ but almost infinitely wider. 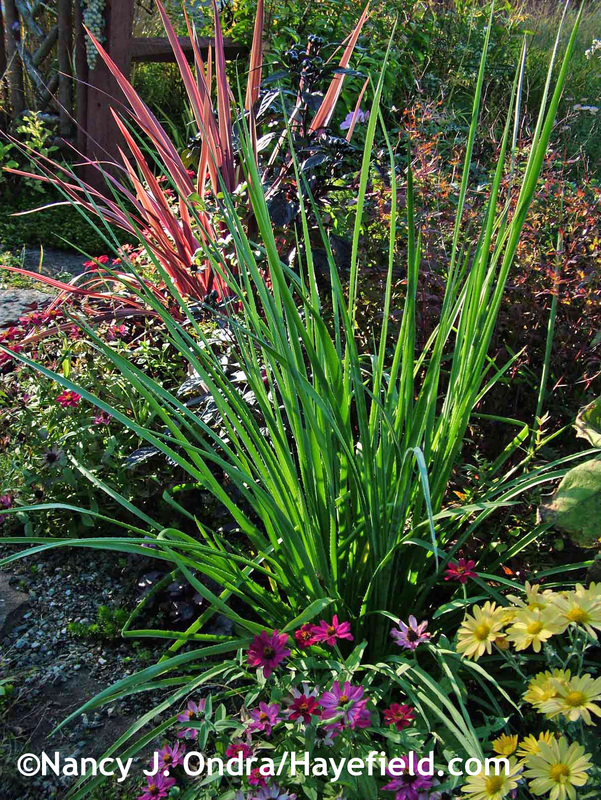 My ‘Crimson Beauty’ has been in place for 13 years now and is now about 2 feet across at the base; it’s an expander but in no way a runner, and it doesn’t seem to set viable seeds – thank goodness! 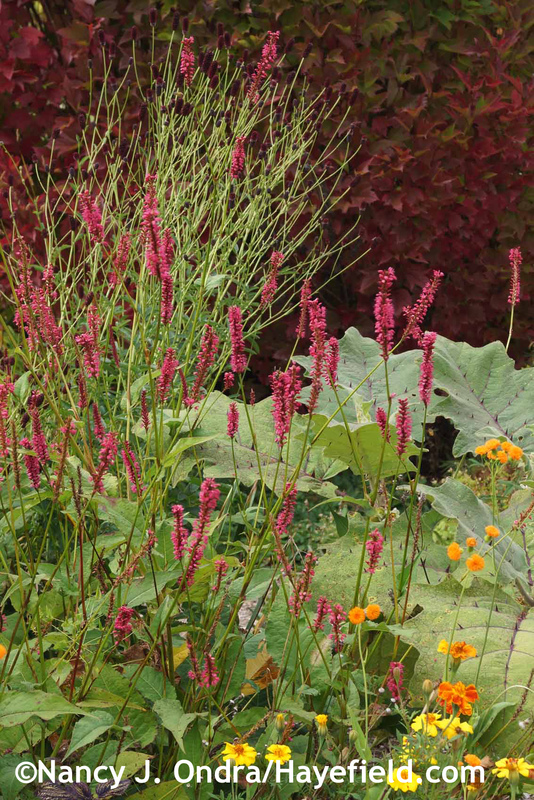 I also really like the various Persicaria amplexicaulis selections for their long bloom period (and for showy foliage on ‘Golden Arrow’). Unfortunately, Japanese beetles like them too, but even when the JBs are bad, the plants usually have time to recover and flower again by this time of year. Every time I consider reducing the gardening , Nancy sends me back to greed and envy.in a good way, Nancy, thanks for another drink from your endless fountain. Good morning, Nancy! It’s been a lovely fall season here, and I hope you’ve enjoyed the same where you are. Thanks for stopping by! 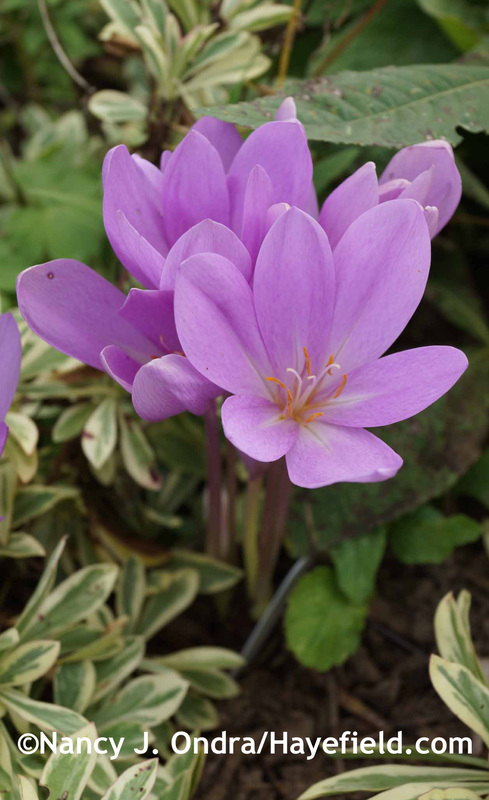 Love your plant combinations with Colchicum varieties. In my garden they are always a bittersweet reminder that the flowering season has just about come to an end although I’m still waiting on my Tatarian aster and Hillside Sheffield Pink mums which may or may not open before a hard frost arrives. Still no heavy frost up your way, Alice? I’m surprised to hear that you’ve been so lucky. May it hold off a while longer so you get to enjoy those two late bloomers! Beautiful and so interesting. So tempting to try the lily seeds. It seems incredible to have blooms the first year. Nice work, Nan. 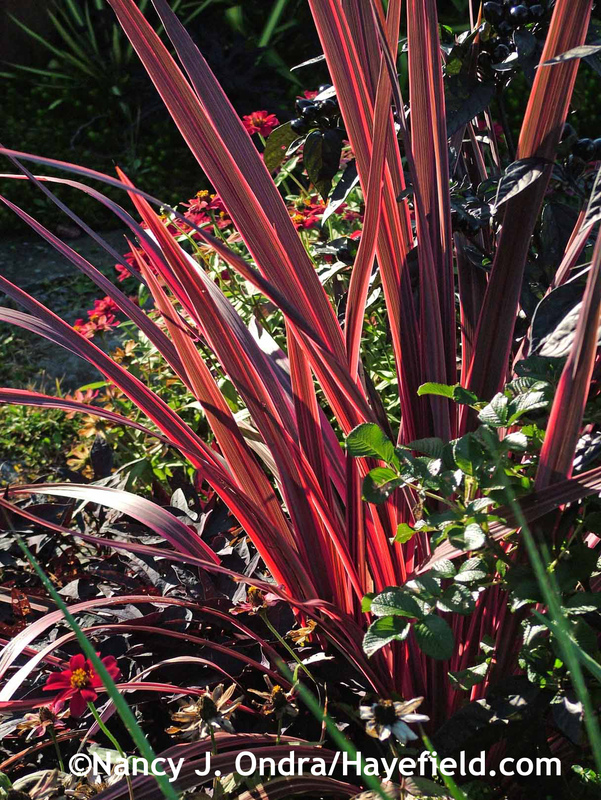 Another takeaway is the Electric Pink cordyline looking so at home in the border. Lovely! 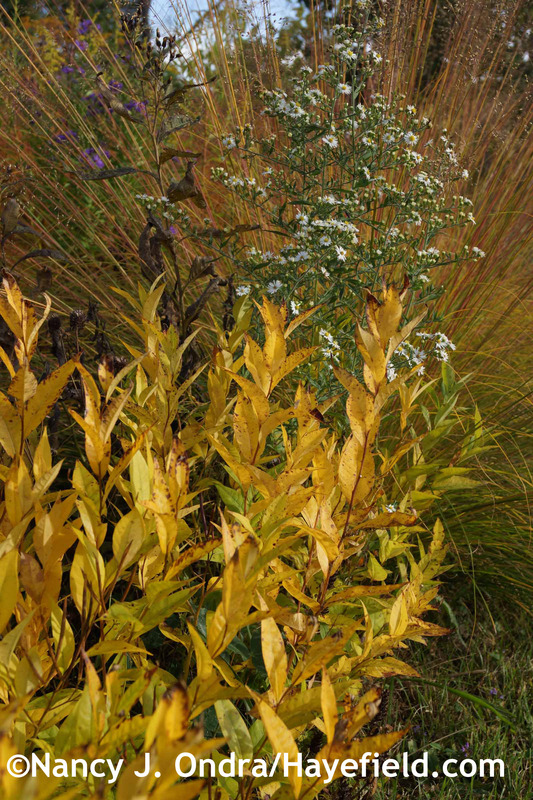 Also found the netted forsythia interesting esp. due to the 3 season interest. And the balloon flower….I had no idea it had gorgeous fall colour. Thanks, Nan. Lilium formosanum is *really* easy, Barbara: so much quicker than other lilies, though I’d never expect them to be annuals! The fall color of the balloon flower does vary: in the same patch, some plants are bright yellow, some are almost purple now, and some have a mix of purple, red, and yellow. I’ve haven’t tracked individual plants to see if the color is similar from year to year, though. 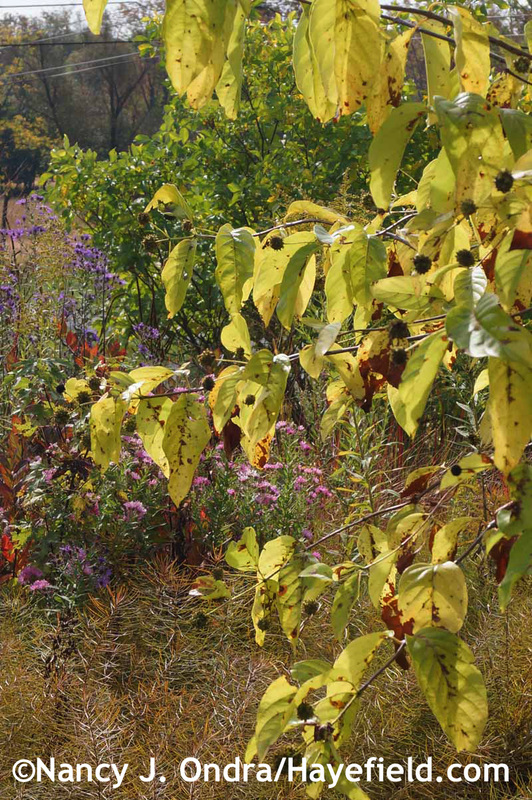 I cannot get over all that is blooming in your garden against that stunning foliage and monarchs still around….paradise! Hey there, Donna! It really is a wonderful time here. I can’t believe we’ve been spared a killing frost so far, and it looks like we might have another couple of weeks. I’ll take whatever we get. I hope you too have a lovely autumn. A visit to your garden is always delicious with your wonderful plant choices and combos and your equally great photographs. Our 16-year-old doublefile Viburnum mostly died last winter. The branches under the snow survived and it’s sending up new growth from the center. We’re hoping some of that new vertical growth will start branching out next summer. 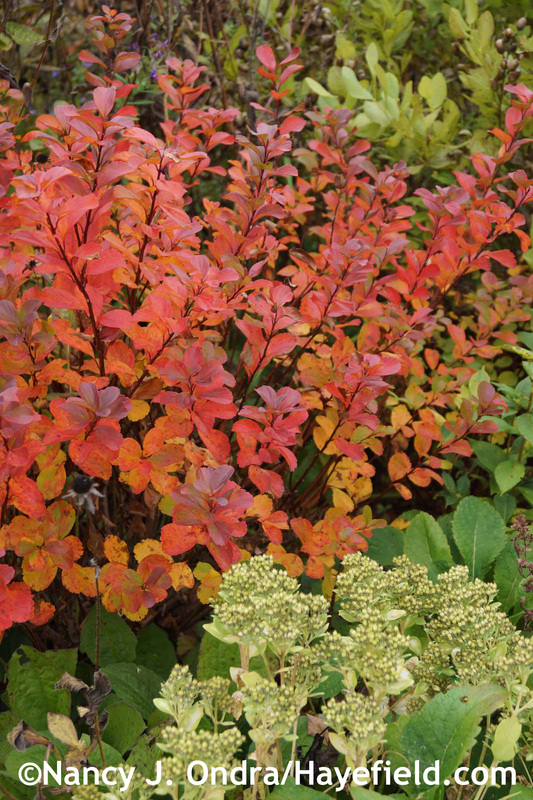 Yours reminded me again of what an outstanding shrub it is. Your poor viburnum, Linda; what a loss. Thank goodness is resprouting for you. 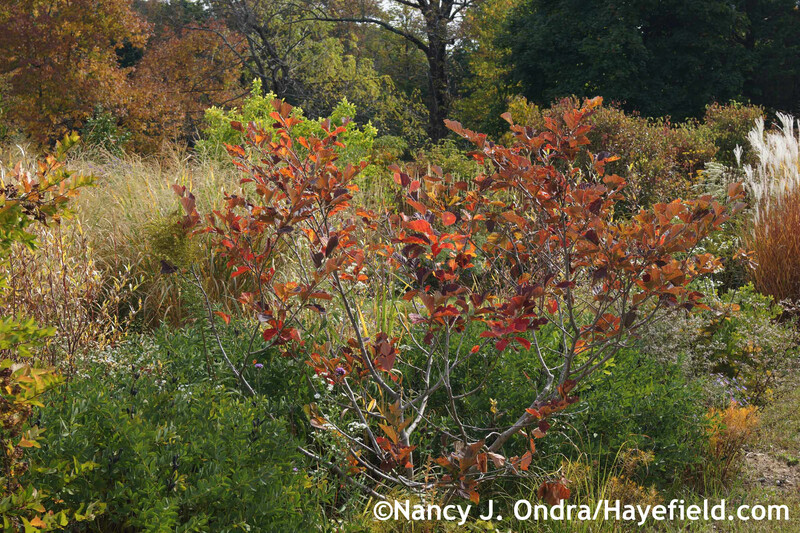 The branching structure is so attractive, and mmm…that fall color is gorgeous. My best wishes for a mild winter and a speedy recovery! 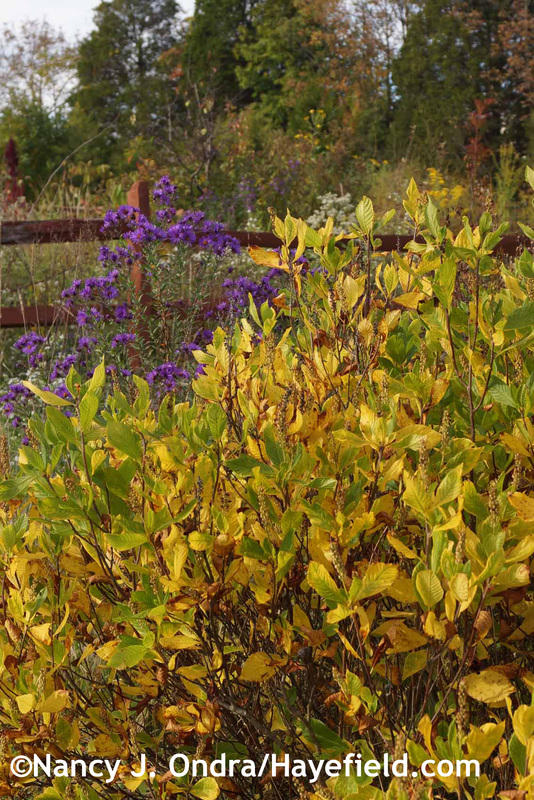 Your garden in fall is just as wonderful as it is in spring and summer, Nan! 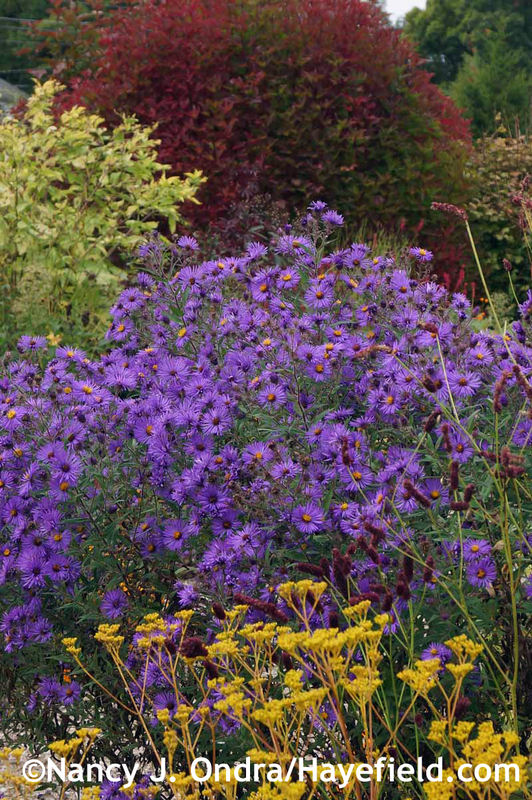 I love the asters and the autumn crocus and plan to add some of both to my garden next year (after my current garden renovation is behind me). I enjoyed the photo of the praying mantis too. Yeah, that praying mantis made me laugh. I’ve never seen one so chilled out like that. 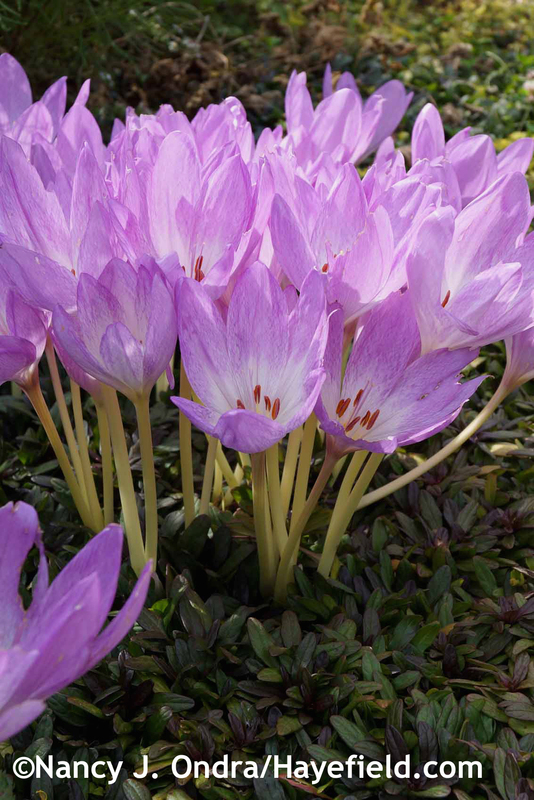 When you’re ready to think about fall bulbs next year, you might want to check out Kathy Purdy’s post Where’s the Best Place to Buy Colchicums? ; she has some really interesting buying tips and leads to sources. Yes, it is all so mouth-wateringly gorgeous. I can’t say what I like best, I like it all so much. I sure am glad you take the time away from your gardening to create posts like like this one. I will come back to it and drool over the colors, the variety, the lushness, the textures, the walking stick, many times in the few weeks. So autumnal, so beautiful. Thank you. Thank *you* for reading, Jane, and for your lovely comment. Putting these posts together is my pleasure–except for the difficulty of cutting many hundreds of photos down to just a few dozen. (I tend to get carried away with the camera this time of year, particularly.) I hope you’re enjoying a beautiful fall in your part of the world! Thank you for linking to my site. Could you tell me more about how you overwinter your cordyline. You take it down to the basement and . . . is it in the dark? Under lights? Bareroot? In its pot? 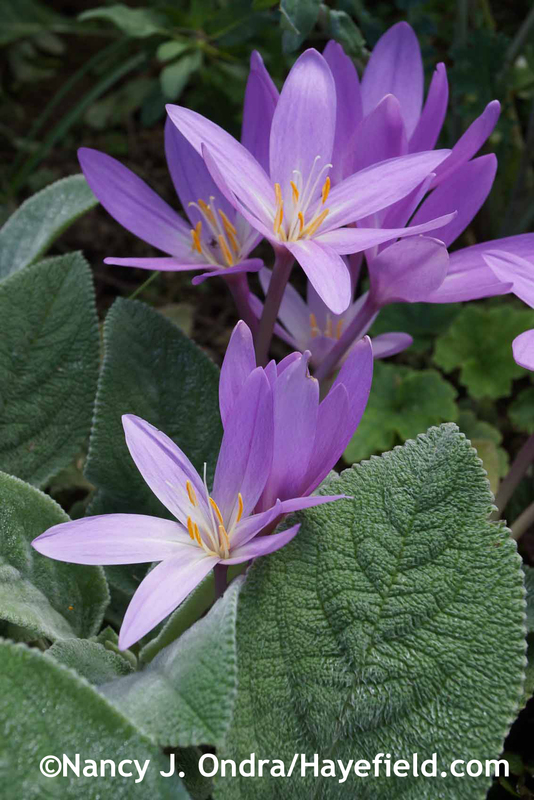 I’ve enjoyed the colchicums so much, Kathy; thank you again for sharing. Last year, I grew the cordyline in a container, so it was pretty easy to bring it inside. This year, I’ll leave a ball of soil around the roots and plunk it into a large pot for the winter. The basement can get down to 35F for a few weeks by the end of the winter; it usually stays around 40F, though. The plants down there get an hour or two of afternoon sun on clear days but are mostly in the dark from November to May: definitely not ideal, but it seems to work for many things. How lovely, I have been looking forward to this post! I recently purchased 2 of your books to help me be a better gardner ( im a beginner) I have been getting a lot of clearance perennials at big box stores ( that is what my budget allows for now im a stay at home mom) because I have a lot of space to fill so I hope they will root and survive the winter.Also have been ordering a lot of seeds based on your posts and which ones easily seed. I already cant wait for spring!!! How wonderful to hear that, Yelena! It’s so exciting that you are starting on your journey as a gardener. I wish you success with your new plantings and many years of joy in developing your gardens. As always Nan a feast for the eyes. I love the Hella Lacy and Golden Lace combination. Unfortunately I lost all the seedlings I had of the latter (I will buy a plant from somewhere). The photo and quip from your Mom about the Amaranths at the front of your house made me laugh lol. The praying Mantis photo is excellent, it obviously liked the softness and comfort of the plectranthus. 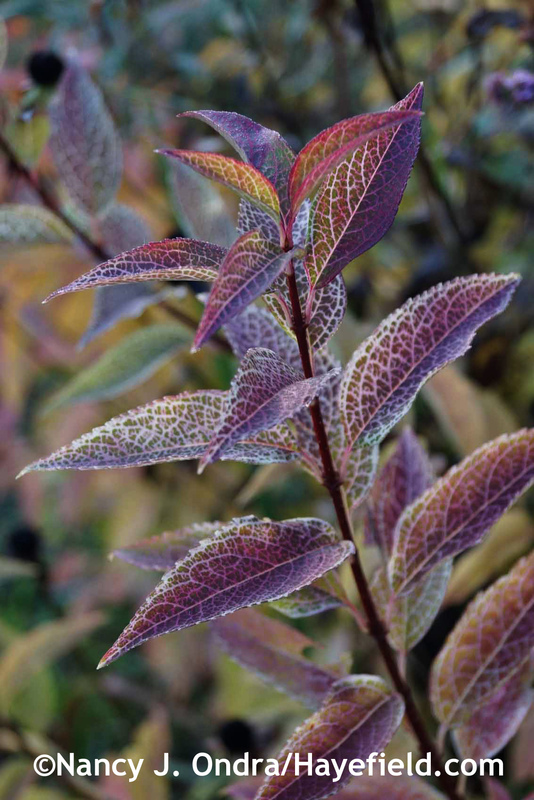 Like you my persicaria seemed to have flowered for months on end, I have the golden leafed form (Golden arrow) which I know you have too. Thanks again Nan for the visual and narrative delights, always a pleasurable way to pass some time. Wonderful to hear from you, Allan. I hope you and the Shelties are well, and that you’ve thoroughly enjoyed your garden this year. Thanks so much for taking the time for a virtual visit today! Hi, Dee! It’s so good to hear that life is settling down for you some, finally, and now you’ll have the winter to recharge for the next gardening season. If you find just one seed capsule of Lilium formosanum, you’ll have enough seeds for a whole garden. They’re so papery that it seems impossible for there to be anything inside of them, but somehow they manage. I always love seeing fall at your garden, the colors and shapes are always so amazing (not that the other seasons are anywhere near shabby!) I’m enjoying the drawn out season here too, the colors seem to be particularly bright this year. My lilies didn’t quite make it this year but tried sending up stalks anyway. I’m sure next year I can see those cool blooms myself! Thank you for sharing your pics again. Beautiful as usual. Favorite pics. The pink mums and the orange tree in the back ground. Love the yellow and pink combination. 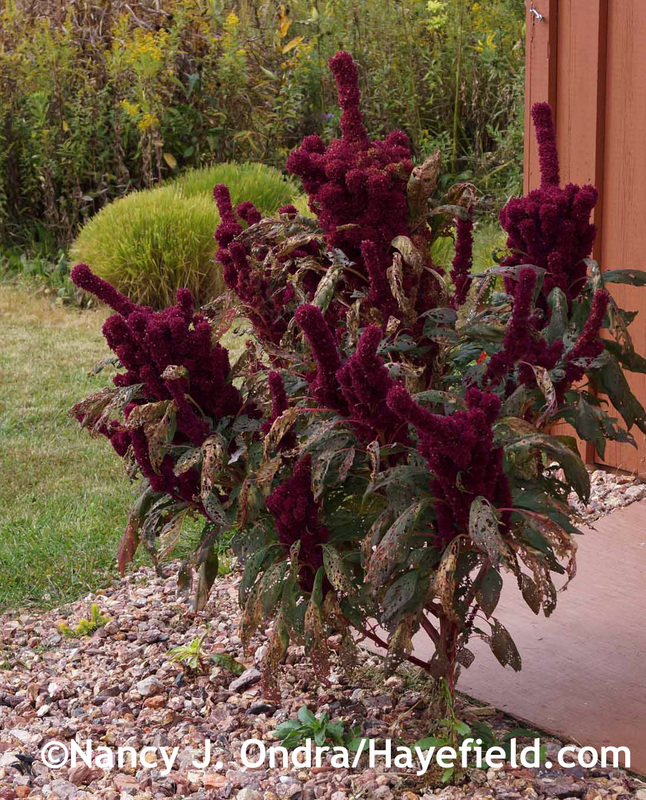 Also love the branching elephant head amaranth. If you looking at the flower part it kind of looks like its giving you “the bird” hahahahaha thats my sense of humor for ya. Funny you should say that, Joshua. I once worked under a head gardener who absolutely *hated* pink and yellow together and wouldn’t let us plant them anywhere near each other. I still think of that when I admire pink-and-yellow combinations. And yeah, you are right about that amaranth! You do such beautiful work! Love your gardens and what I find also very impressive are the photographs and your detail of the plants. I love that you know all of the cultivars! You truly give me what I need to be inspired to try new plants and new combinations. I live in a zone 6 garden, so many of the plants you show can be grown where I live. Not everything, as I have a more alkaline soil, but many things. Thank you for sharing so much!!! You’re so kind; thank you! It’s wonderful to know that you find the posts useful; that makes the effort worthwhile. My best to you and your garden! Hi Anna! 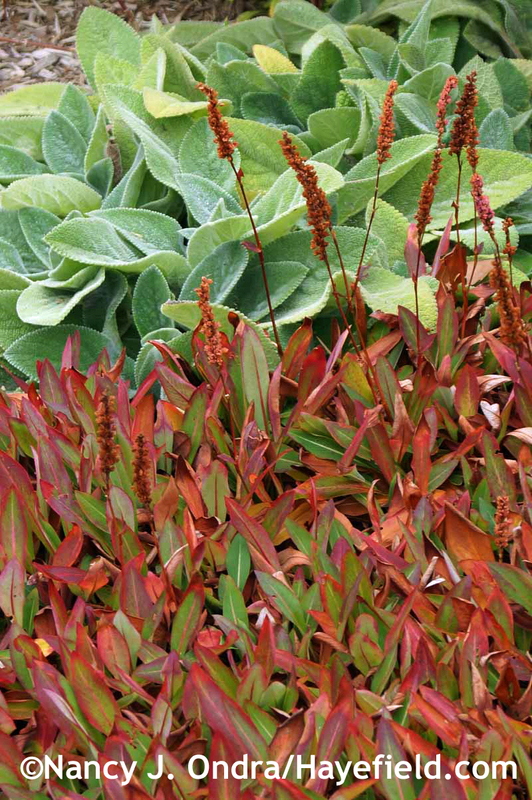 That is such a simple combination: two plants that need almost no maintenance (just a June shearing for the lamb’s ears) but that look so good for months–particularly when the fall color shows up on the Persicaria. And yes, going from seed to flower in one growing season is simply amazing for a lily. The ones that first opened are now trying to make seed, but I don’t think they’ll mature before the weather gets too cold. If the bulbs overwinter, I hope to have seeds to share next year. 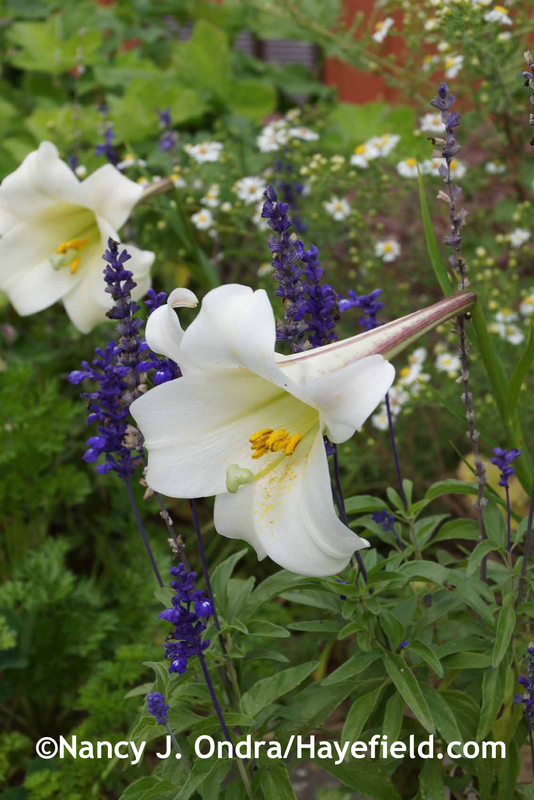 If you’re looking elsewhere, see if you can find Lilium formosanum var. pricei (which is what I think this one must be). What a feast for the eyes. I am so impressed with your green thumb. You have such a knack for design. Beautiful pics. Thanks so much for visiting, Grace. The plants have really outdone themselves this fall, and the mostly lovely weather has helped a lot! Thanks, Nan. 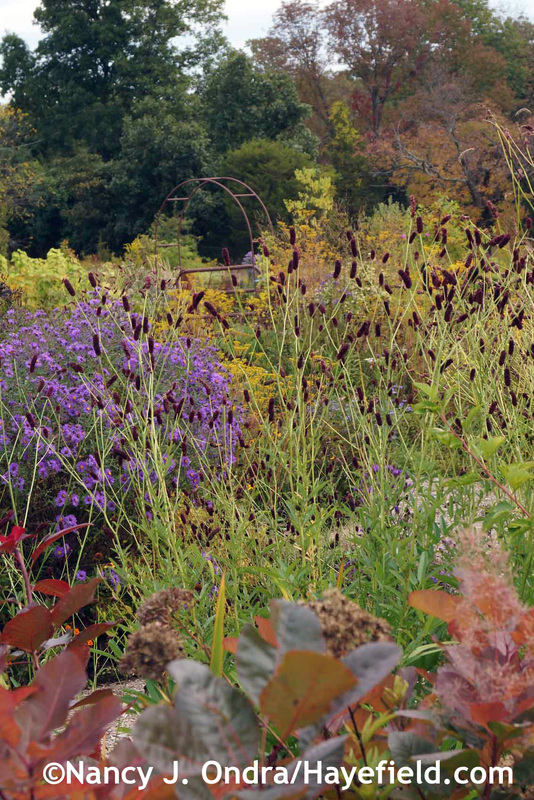 I’m surprised not to see Muhlenbergia capillaris among your photos, since I picture your “Fallscaping” book’s most inspiring cover when I contemplate the pleasures of an October garden. 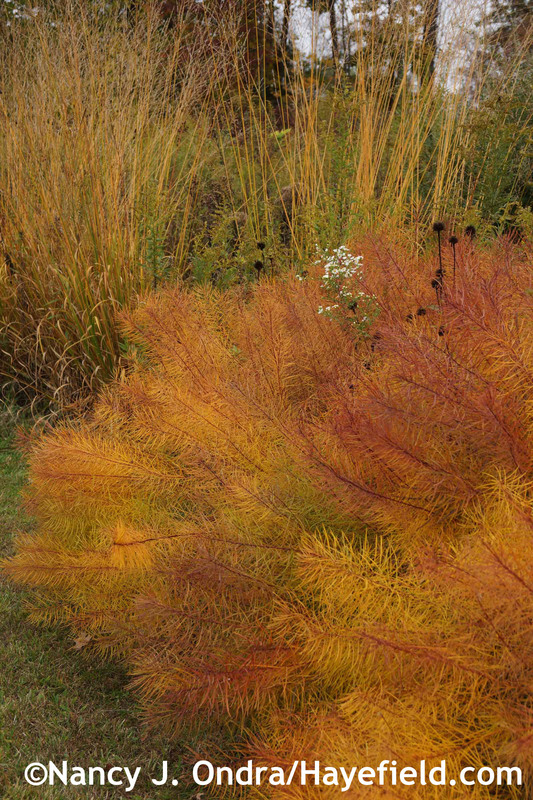 While not straightforward clean colors, the mix of Pink Muhly Grass and fading Arkansas bluestar is surely proof positive that pink and yellow can be splendid color companions. Have you grown annual Gomphocarpus physocarpus? This tall and impressive cousin of Asclepias is new to me, but I’ve had my eye on it at Chanticleer this season and it’s a “Wow” now………seems like a “must have” for your garden. Hopefully somebody must be saving that white fluff and the attached seeds, perhaps for HPS-MAG seed exchange. Hi Eric! I lost those Muhlenbergia clumps a year or two after that shot. I finally replanted three this spring, but they didn’t do much, and I’ll be surprised if they make it. Maybe I’ll get some re-established next year. Yes, I have grown Gomphocarpus in the past (from seed I got through the HPS/MAG Seed Exchange, as a matter of fact). Here, it usually gets frosted before the seedpods form, but the flowers are interesting. In Phila., we lost one of three clumps this past winter but replaced it with one which bloomed just a bit later but with surprising vigor. And just 2 days ago, I was shocked to see lots of them in bloom, just planted in beds surrounding a new CVS drugstore parking lot……perhaps that plant selection came because of a November grand opening. Oh, that’s interesting. My creeping bramble actually did well and held its leaves through the winter due to the snow cover. And yeah, I could well be wrong, I think it’s very unlikely the Gomphocarpus would self-sow in our area. Even when I start it indoors in early March, I barely get pods here by mid-October.